Mavis Pusey is a painter, printmaker, and educator whose geometric abstractions interpret the vibrant art scenes of New York, London, and Paris. 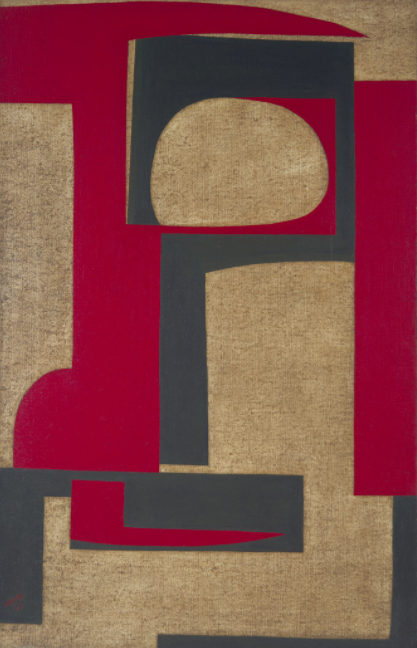 One of Pusey’s earlier works, Solitude (1963), exemplifies her mastery of color and line. Pusey moved to New York at the age of 18 to pursue a degree in fashion design at the Traphagen School of Fashion. However, after two years of financial difficulties, she left the school, worked in a bridal boutique, and enrolled in fine arts classes at the Art Students League—an institution that accommodated her work schedule. She took courses under the instruction of renowned artists Harry Sternberg and Will Barnet. Barnet convinced Pusey to continue working in painting and introduced her to the works of modern masters. The “energy, rhythm, and movement” in Vasily Kandinsky’s work, in particular, inspired Pusey.